Waterparks, for the most part, put guests in the role of active spectator. You enter a slide, and things happen to you. SeaWorld’s Aquatica branded waterparks have always aimed to give guests a unique animal experience by putting them side by side with the sea. Aquatica brought guests closer to the animals, but the experience was still that of a spectator. Aquatica San Antonio changed that role a bit when it opened in 2012, making the experience a bit more interactive with hands on activities such as stingray feeding and animal ambassador interactions. 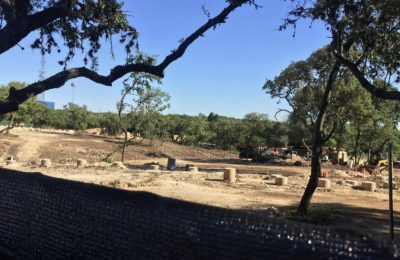 This summer, however, the glistening jewel in the heart of Texas is making the experience even more hands on with Roa’s Aviary, an all new way to experience nature, and make even more animal connections than before. 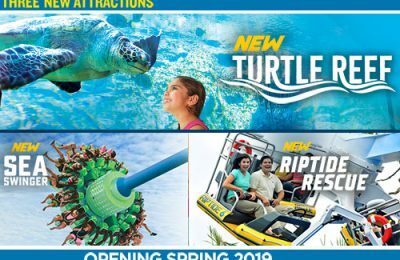 We were on hand to not only see the final moments of construction, but also to experience the all new attraction as it went from just another lazy river, to an all new interactive experience at Aquatica San Antonio. Roa’s Aviary at Aquatica San Antonio is the newest attraction at the SeaWorld waterpark, in fact it’s the first major attraction that’s opened since the park opened in 2012. 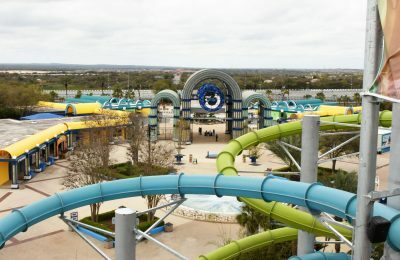 As part of SeaWorld’s 50th anniversary celebration, the parks have given the guests the gifts with all new attractions at each of the three Aquatica Waterparks. Aqutica Orlando has recently opened Ihus Breakaway Falls, a thrilling drop slide. Aquatica San Diego has opened Taumuta Racers, a group of racing slides. Breaking that trend completely is Roa’s Aviary. Instead of being in a slide, and have things happen to you or around you, you are immersed in a completely interactive adventure. Not only do guests get to drift through an all new environment, full of waterfalls and new ways to get wet, but Roa’s is also full of birds who are free to roam and connect with you any way they see fit. The all new aviary boasts several different species of birds, including some that are on the endangered and threatened lists. The birds are all free to roam around, and interact with guests. Of course, the best interactions come from food. Guests can purchase food to feed the birds, however, the birds may or may not respond…Roa’s Aviary is their house, and they do as they please. While the birds are the main attraction, interaction with the birds isn’t mandatory to experience the fun of Roa’s Aviary. The all new aviary is actually an addition to the park’s existing lazy river, Loggerhead Lane. Loggerhead Lane goes the normal path, only now it diverts into the aviary, where guests can choose to either get out and interact with the birds, or simply drift along and take in the sights. For those not wanting to brave Loggerhead Lane, Roa’s Aviary also brings an all new beach area to the park. The beach overlooks the aviary, which you can access either through the door, Loggerhead Lane, or right through the waterfall. The waterfall is located right in the middle of a shallow entry pool, where little guests can splash and play or simply sit on the edges. Once inside there are bright green sunken chairs where guests can sit and relax and just watch the birds as well. While it may seem like the attraction just popped over night, it’s actually been a labor of love, planting seeds…or should we say hatching eggs, over a year ago. Many of the birds that are in the aviary were hatched and hand raised just for the aviary. The birds weren’t purchased from a retailer, they weren’t captured from the wild, they were all hand raised. Eventually there will be over 300 birds in the aviary for guests to enjoy. Also, we got a bit of a sneak peek before the attraction was opened to the first guests. Crews were busily getting thing lined up, and polished up right until just moments before the birds were introduced. Everything had to be just perfect for the new residents of the aviary. Roa’s Aviary has no height restrictions, and can be enjoyed by the entire family. For those that want to feed the animals, guests can purchase food while supplies are available. The birds are free to do as they please, and you may get landed on. Slideshow-Check out even more pictures from Roa’s Aviary and Aquatica San Antonio! Roa’s Aviary also has an amazing light feature, and is stunning at night, giving guests a reason to keep coming back nightly. As the sun goes down, some birds may choose to sleep, but others are even more active than in the day. Stay tuned for even more from Aquatica and SeaWorld San Antonio, and be sure to get social with us on Facebook and follow along with us on Twitter @BehindThrills for the latest updates! For more information about Roa’s Aviary at Aquatica San Antonio, visit the official website by clicking here!